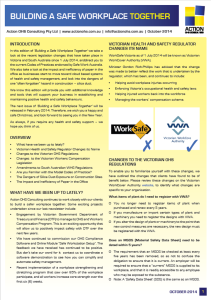 Please find Action OHS Consulting’s October 2014 edition of our 4-monthly newsletter Building a Safe Workplace Together. In this edition we take a look at the recent legislation changes that have taken place in Victoria and South Australia and direct you to the current Codes of Practices endorsed by Safe Work Australia. We also take a look at the impact and inefficiency of paper in the office as businesses start to move toward cloud based systems of health and safety management & the risk associated with silica dust in construction work.